My daughter just gave me the secon series of the Crown. Looking forward to watching the second one.Enjoyed the first. Too nay Reality shows. Watch mkr aand House Rules. Dating shows not necessary. Been catching up on the Outlander series. through the local library, Series quite good. Love the theme music and the country side of Scotand is magnificent. If you want to watch secon series sexually implicitOther than the story line is good. Thanks for thereminder Micha, I watch that with my youngest granddaughter. ... interesting "goss." Cats ..... I don't watch that show but do sometimes "flip" thru' it. Yes, interesting Cats, I normally watch it in bits -- but those lot might be interesting -- it really brings out their personalities IMO how they handle things says a lot about them. I would LOVE to see that Chris Brown put into the show, it seems he really gets off on seeing others suffer. I will tape it as I normally do that way can watch what you like -- and it is a good indication of personalities -- like that Anthony Mundine -- not so tough -- and that spoilt tennis player. Henri Paul also "disappeared" from the Ritz Hotel for a 3 hour period (prior to being "nominated" driver....) and when searched after death...had a bankroll of $3000 in his clothing and had $2 mill in the bank and....also had a secret file with M16! This doco. guy suggests he was paid the $3000 cash that same night - but - had no idea he could possibly be going to die?? Also - the French police - brought in water trucks and hosed down the Tunnel within a 3 1/2hr. period of Diana's death - erasing any clues that may have been found by forenscic - that turned up later! ALSO - there was the initial letter that Diana's butler Paul B. has (and kept to this day!) from her - saying she was certain she was being targeted by the "Establishment" to die in an "accidental car crash"! This Doco. is the best I have ever seen (on this partic. topic) ....and left one with a huge ?mark........and thinking YES............... her death was planned by the "Royals" .............. or was it??? Makes one wonder eh - interesting!!! Thanks Foxy. Certainly plenty to think about. Oh wow RnR - thanks so much for that link! Even threw more "light" into this bizarre event ........ how interesting was some of that extra info. Thank you Foxy & RnR -- sure did read it all and NOTHING surprises me at all I have always felt that there were some very suspicious circumstances around that accident I am also SURE that Diana would have spoken out about MANY things down the line too. It's amazing how they can present the facts in such a way it creates doubt about what we might have previously believed. Of course, that doesn't mean they aren't right about Diana, that's one that refuses to go away, much like the Kennedy assasination. ...this Doco. certainly made one "think outside the box" (so to speak) ...and the fact that the paparazzi guy ended up the way he did? What would be the motive for killing him in such a bizarre way? Elvis and Kennedy ....well Elvis is gone!! ... and didn't they say Lee Harvey Oswald killed Kennedy? Moon landing??? .... good theories on that one too .....why has there never ever been one since 1972? Our technology is wayyyyy more advanced.....? Also - bizarre how the Astronauts all went a bit "nutty/religious" on their return? James Irwin even stated he had "an encounter with God" on the moon! Neil Armstrongs moon boots photographed in the Smithsonian. Are these his boots? Or did Armstrong have grippers attached to his boots, if so why arent they also on display? 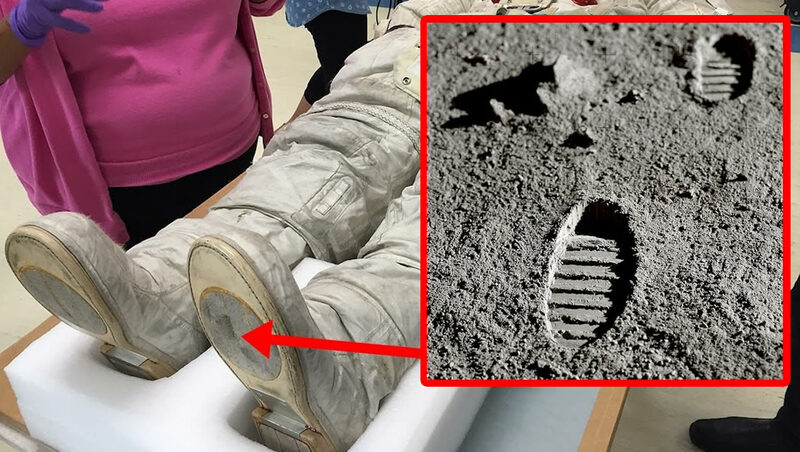 The 'wrong' boot print debunked by Snopes. I initially read the 2nd. one on the list: "Stanley Kubrick says peodophiles run the world...."
..... it is Nicol Kidman that perhaps casts the "doubt" as she says "the dark secret/secret" is with her which she feels she can never divulge.......after forming her "friendship" with Kubrick ......... lots of this online - is interesting .....happy reading lol - there is heaps there! Hey is anyone else getting these annoying video ads/clips that appear on the RHS lower screen when you go into any Topic? Sick of keep having to get rid of 'em ....... arghhh!! .... thanks - will do! I watched 1984 yesterday afternoon -- very difficult to understand fully and a horrid film as such -- but really what is taking place -- when you look into it. Certainly not an easy film to get your head around. .... however - not "all good" as Netflix (for the first time also...) has had to put out "Warnings" against the morons that are now on YouTube etc. doing what has been named ...... the "Bird Box Challenge" !!! ...these idiots are blindfolding themselves (..as in Bird Box) and attempting to do ridiculous crazy things as depicted in the movie!! You have to ask - "Seriously??? Wtf is wrong with people these days?" ....... can't see a movie - enjoy it (or not) but then to go home and try to emulate scenes etc. Bizarre! ... have missed out on seeing 1984.........might have to get Netflix haha ....... there is also a shocker of a movie called "Threads" ....in which the media state apparently all the audience (worldwide) walk out numbed and in total silence at the end ........ interesting ..
...about a contingent of Irish Police brought into to combat crime in WA and the difference between "their way" and "our way" in approaching various situations. Could perhaps .....be interesting ? I bought a copy of 1984 Foxy --- I have not heard of the Bird Box -- THINK I have heard of threads --?? Wow have just looked them up all sound horrid -- are we being told something???!!! .... yet they had already been brought out here with a guaranteed "permanent citizenship/residency" - massive salary increases (compared to Ireland) ...I have to raise the question as to why there are not enough Aussies to take on training or who are not willing to do the job? We probably pay too much welfare benefits - lol - why would Aussies bother? Any ideas? Also... I wonder if these Irish cops have to sign any type of contract to say they will stay in the police force for "x" number of years? Else would be an easy way to gain permanent citizenship in Oz and then move on to something different or to another State .......... just another Govt. "deal" that I had never heard of? Yes, Lambie is one that does not back down -- or has not as yet -- will be interesting to see what that little creep Dast does -- I think there is supposed to be another Pollie in there too ??? .... TONIGHT: (Tues. ) 8 pm. ABC "Foreign Correspondent"
"India's Wild Elephants" .............. Doco. explores how these majestic creatures are being squeezed out of their own habitat by India's fast growing population. ... be NO beautiful wild animals/birds left soon - whole world is disgusting! Don't think I mentioned it prior ....but last year (and just up the road from me here on the coast) there is a massive "treed" (or was "treed") - South East Water catchement. Heavens knows what this "catchement" is meant to achieve - as - even during winter and at any given time - all it has in it is like 2 or 3 feet. of stagnant looking yukky water....bizarre. Anyway - the whole catchement was surrounded by magnificient 60ft - to 80 ft. Pine Trees..... one morning - an army of "morons" with chainsaws/trucks/chippers etc. rocked up and started cutting down each of these trees!!! People were horrified!!! There was approx. 30-40 trees!!! Out fell - possums!! Out flew hundreds of birds - in particular Tawny Frogmouth Owls!! Owls that had lived here on the coast for many years in the plantation (where the catchement is) ! The poor Owls were in such shock that a about 9 of them - flew onto my block (one of the few left with huge tree's on it) and hunched together in tree's they would normally never live in..... for almost a week!!! I called South East Water - to ask - why these tree's were being removed etc. etc. - got the mega "run-around" until finally some curt "male blonk" informed me - it was their property and they did not owe anyone an explanation as to what they did with it!!! Nice!!! The area has never been the same since - Native birds and creatures that were living there - all but gone! Pathetic! World is a sad place....and getting worse! Very sad story about SEW removing the trees Foxy. To what end I wonder. We are a state owned corporation responsible to the Department of Environment, Land, Water and Planning. We are regulated by the Department of Health and Human Services for drinking water quality, the Environment Protection Authority for recycled water quality, and the Essential Services Commission is the water industry’s economic regulator. We collect waterways and drainage charges on behalf of Melbourne Water, and the annual parks charge on behalf of Parks Victoria. Interesting that it's state owned. I rang my local council to ask if I could trim a Paperbark tree which was overhanging my fence. They said they would have to send out an inspector and then I would need a permit. It was only two branches. Anyway my neighbour got up on the fence with a small chain-saw and trimmed it for me. End of story. Foxy that is so sad and it is happening all the time everywhere -- happens here -- which is a very bushy area and slowly homes are taking over and so many people just do not care if they live in a sterile environment -- still heaps of bush around here BUT slowly but quicker as time goes -- and we have SO much wildlife here Koalas as well -- I tell you every time someone builds a house I plant yet another tree -- as I have a double block and I plant natives FOR the Natives -- but I wish those rotten owners of CATS that allow them to roam day and night would do the right thing --- people that have cats should be by law made to keep them inside or in a restricted area -- as they are natural killing machines and have killed so many native Animals on my block alone God knows where else. The council does not care a hoot and says as long as they are chipped all OK -- well chipping and desexing does NOT stop them killing --and just for kicks! There is a mini series about gender dysmorphia starting on SBS tonight at 9.45pm. Called BUTTERFLY. Did anyone watch Stop Laughing on ABC last night? It is part 1 of 3 and examines the creative genius of some of Australia's comic icons. It was a brilliant show and can't wait to see the next 2 shows. Saw the "list" so far of the "Celebrity" Jungle people - didn't see that whimp Daystari on the list? Media are calling it the "D-List of Celebs." this year .....I only know maybe half a dozen names - if that?? Some "Gogglebox" people are there also (I don 't watch that) so don't know who "they" are? lol - yeah yeah - I know! Actually I do remember who he is etc. (I'm not a footy fan) .......Barnaby's too busy "making babies" (perish the thought) ....isn't his partner preggers again with another boy??? Thats if you believe in "media gosspi" I guess ..........?